This New Year’s Eve, I did a gig with three bands switching between two different rooms. Each time, I had to pop in quickly, set up my gear and dial some EQ settings for a clear sound. One room was a small-ish lounge, and the other was a ballroom. In both rooms, the host bass amp was dialed in with a smiley EQ. That is, the bass was boosted, the treble was boosted, and the mids were either left flat or cut somewhat. To my ear, that kind of bass EQ doesn’t cut it – literally! It sounds big and powerful, but lacks the note definition that helps your bandmates play off of what you’ve done on bass. With a smiley EQ, the bottom end is mucky, while the top end emphasizes string noise. A smiley EQ is great if you’re a slap player, but can cause sonic problems in muddy-sounding rooms. My preference in most rooms is to EQ with a moderate frown instead. To do that, the lows are cut a little, the highs are cut a little, and the mids are boosted a bit around 500 to 800 hz. Rather than filling up sonic space, the frown EQ allows good note definition without sounding too clanky. My bandmates tell me that they key off of my pitch for singing as well as hearing the roots of the chord changes; when I use the frown EQ, they really get something useful to work off of. A moderate frown EQ helps enhance note definition and the degree of curve can be increased for better cut through the mix without being annoying. Let me step back for a little context. Most of my gigs are with a blues and R&B band, anchoring both the beat and the chordal foundations. I usually double on electric bass (lately, a five string G&L) and electric upright (an Azola BugBass). To double like this requires using a switch box with different EQ and volume settings for each axe. For the past few gigs, I’ve used a Radial BassBone with good results. With the BassBone, the G&L goes through the flat channel, with the amp EQ’d for this bass. Because this bass is a little bright (neck pickup, active mode, parallel pickup wiring), it takes very little EQ to do the job – mostly just cutting the low end a little around 80 to 100 hz. The G&L L-2500 actually has enough EQ options through its two pickups, series/parallel wiring, passive/active/brite preamp settings, and bass/treble cut, that I can dial in almost anything I need on the fly – no extra EQ needed to fine tune once we start playing and get used to a room. The BugBass, however, is a bit bottom heavy and needs a little different EQ to cut through cleanly. Using the BassBone’s second channel, I added a bit of highs, boosted the mids (centered at 470 hz) and left the bottom end flat. That brought out a nice, focused sound. Now it was just a matter of switching basses and I was good to go. Back to the New Year’s Eve gig. That sounded like a variation on the dreaded smiley-face EQ! Before we went up to play, a guitar/singer solo act warmed up the room. The Jazz Bass-flatwounds player had sat in for a song. “He sounded like total mud,” our harmonica player warned me. That was a good key for setting up. First thing, set the amp flat, listen. Next, tweak the EQ for a well-defined sound. That meant bumping the mids a little. Voila! There it was. On an amp with a three-band EQ like the one I used for the first set, it’s not literally a frown EQ because there are only three tone knobs – but flat treble/bass plus a bit of mid boost is approximately the same thing. Second set, more of the same. This time it was a large, deep ballroom. The low end sounded like a canon and I knew there would be little chance of getting a great stage sound. I looked at the amp and found the bass and treble both up three-quarters. There was a graphic EQ, too, but it had a relatively modest amount of tone shaping. In that situation, the plan calls for two EQ settings – one for the stage, one for the house. To do that, I sent a pre-EQ direct feed to the house and let the sound tech get the house mix in good shape. Then, for my sound on this boomy stage, I set the amp EQ a bit ugly, with reduced bass, plus boosted mids and highs. You’ll hear better and there will be some sonic space left for the drums and other low end stuff. And the house gets the good sound, straight from your bass. For this set, I never could hear myself all that well – sheer volume isn’t the answer – but seeing the dance floor filling up told me that the house mix was fine. I thought that set three would be a piece of cake because it was the same room and rig and the first set... Of course not. As it turned out, the amp in that room had died mid-set and they were planning to run me direct to the little PA. When you’re doing a busy, messy gig like this, you smile like a real trooper and try to keep the sound techs happy, so I planned to take care of my EQ with the BassBone and the G&L’s option straight through to the PA. But the lounge brought yet another surprise. Rather than the DI-to-PA as expected, they’d managed to find a combo amp with a 15” speaker and 7-band EQ. It was actually sitting on top of the cab from the dead rig, so I knew there would be less bottom end – that’s what happens when you raise a speaker cab off the floor. No surprise, though – the graphic EQ was set up in a smiley face. I tried flattening out the curve, but the amp sounded hollow and boxy that way. This time, I ended up with a low-mid hump in the EQ curve, enough to give the sound some body, but avoiding the boomy bass frequencies. Low-mid hump EQ gives thickness to your notes without adding a lot of mud. That did the trick and the set went well. Again, good clarity from the amp, with nice pitch definition. And the punch was good, too. Sonic Victory: 3 for 3! So that was my EQ experience for New Year’s Eve. 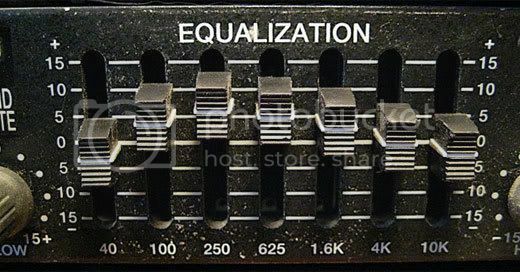 In each case, I found a smiley EQ on the amp – scooped mids, boosted highs and lows – and shifted toward a tone that brought out the mids in the 500 to 800 hz range instead to help define my notes and make the playing more distinct. Years before that, I thought pushing the highs was the answer, so I hit the amp’s brite switch. That just made things annoying to the ear and didn’t get me through the mix any better. When I discovered the power of mids, things started to shape up and I was able to fit in with the band’s mix better by finesse. Keep that idea in mind the next time you’re having trouble with your bass EQ at a gig. Avoid the temptation to set up the smiley face on amp. And bring out a smile for the frown.